Our Adult Program is for students from 14 to 80! 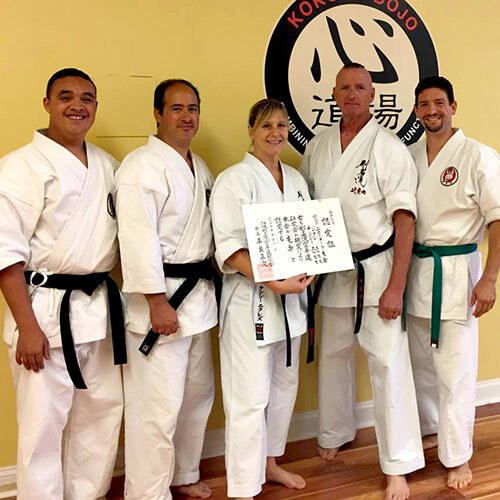 There are four 45 minute classes offered weekly, plus the Saturday practice session, and students can train as often or as little as they choose. We practice specific exercises meant to build strength, endurance, stability and confidence while teaching real karate techniques. Here, as with the children's classes, we teach real techniques for real life based on kata (forms), bunkai (analysis of the forms, performed with two people) and kiso kumite (fighting drills and counter attacks). We work drills based on natural reactions and body movements. Our karate is not a quick program, but we take time to practice techniques over and over to build the ability to utilize them without thought.